From ‘The Manual and theory of Classical Theatrical Dancing (Cecchetti Method)’ by Cyril W Beaumont and Stanislas Idzikowske. I’m studying for my Ballet teaching qualifications in the Cecchetti school of classical ballet, hence reading ‘The Manual’ as it is affectionately known. The quote got me thinking about all the lines in my life – lines of singing; a line of violin music, the line of the strings and the lines of the bow; a line of written music. Lines of the body in dancing. Lines of dancing interwoven with lines of music. Thousands and thousands of lines of writing and reading. But the quote is also about practise, and practise is a habit as much as anything else. I’m so out of the habit of blogging about my sewing. I’ve been concentrating so hard on my dance teaching and study this year that the sewing blogging’s fallen by the wayside, especially with the grief of losing Hattie and the strong association she had with my sewing blogging. You know, it’s been over a year, and finally in the past month or so I’ve been able to look at a photo of her without curling up in hurt. So I’m going to celebrate this with a picture of her! Look at her dear little face! And her skull and crossbones name tag, which suited her personality so well! Ok, that’s all I can tolerate for the moment. Moving on hastily … I also started a ballet blog. It was supposed to be the ‘landing page’ for my dance teaching, but in reality the facebook page does that job. It’s a lot of work to upkeep 2 blogs and one facebook page. I’ve been contemplating closing down the sewing blog and concentrating on the ballet blog. Or vice versa? Lots of lines of thought about my different options! But all those lines of thought brought me back to the reason I started this blog. I loved reading about other people’s experience of sewing – why they sew what they sew, what challenges they have, how they solved them. And my favourite, the piccies of the outcomes. I wanted to give something back to the online sewing community that I’d gotten so much from. I think these reasons still stand. I might, however, focus more on the whys than the whats though. Just change my focus a tad, see if that is more to my liking. And getting back to the lines in my life, and the habit of practise, keeping a blog is as much a habit as anything else. I’m going to work to get back into the habit of posting. I’ll aim for once a fortnight. If that’s a bit much I’ll try for every 3 weeks. Since the blog isn’t doing the job I started it for, do I continue with it? I don’t really know what I want to say through it. I don’t want to write ‘how to do ballet’ stuff. The internet is stuffed with social media covering that. *pfft* No need for me to re-invent the wheel. I had intended to explore ballet photography, but it hasn’t worked. My phone camera is extremely limiting and I don’t have enough $$ to buy a decent camera. My students aren’t keen on having their pictures taken. I can take pictures of me but … There’s a limit to what I want to put online. Me in clothes I’ve sewn doesn’t seem to worry me. But the dance stuff…? There’s … well, what’s out there is so ‘perfect’, with almost no normal everyday imperfect photos Sewing blogs quite a strong culture of being straightforward and honest about your sewing experiences and your body. With ballet, I fear that anything I post that’s not ‘perfect’ will open myself up to the vitriol that is out there on the internet, especially against women. It feels like the equivalent of putting online photos of the lingerie you’ve made yourself, ON yourself, with your face clearly showing. In spite of the culture of honesty, most sewing bloggers aren’t prepared to do that. I suspect that’s also why my students aren’t keen on having their photos taken and put on my blog. Essentially, we don’t feel safe enough to put such incredibly personal images of ourselves and our bodies online. What use then for my ballet blog? Every so often I find something I want to explore. Like the concept of lines. And the concept of the different lines of writing-style between the authors of the different textbooks, which would be my next post if I continue the blog. Then there are just more fun things out there. The more light-hearted side of dance. There’s also fair bit of crossover between the two blogs. I’m doing a lot of sewing of dance gear. For eg, I chopped up a too-small leotard and added a skirt and cute sleevy-things out of ‘dry knit’ from Spotlight, to create an as-yet unblogged-about ballet-teaching dress. When mum my Reluctant Photographer took photos for this blog she snapped this shot which I think of as my Degas photo. That slight rounding of the shoulders and upper back of a dancer ‘off-duty’, expressive of the fatigue from working so hard is a … well, a line (!) of body I see often in ballet classes. I love how Degas captures the realities of dance. I love how mum captured that in my own stance. Definitely a crossover of concepts between dance and sewing there! So maybe I do have things to say on a ballet blog. Just not a huge amount. 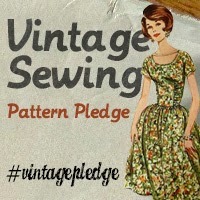 With my sewing blog there has been plenty of times where I’ve averaged one post a month. I figure that would be just fine for my ballet blog too. Having a goal is always helpful. A few months ago I was looking for something different to wear to tango practicas. 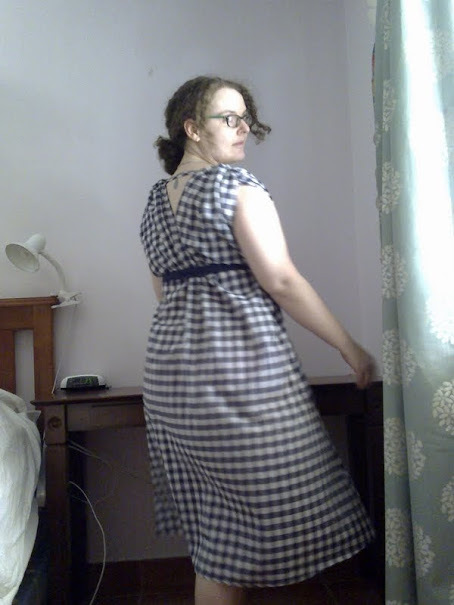 I had 3m of blue-and-white 1″ gingham, and an afternoon. I’ve been admiring Tanitisis’s Grecian Sundress which I’d pinned on my pinterest sewing boards. There was another, similar dress I’d pinned that was basically a long rectangle with a slit for the head/neckline. I decided to go for Tanitisis‘s dress because I’ve got quite marked sloping shoulders, and I thought her dress was less likely to fall off me. And I loved the gathers across the shoulders too. I downloaded it, stuck the pattern together (I’m getting really quick at that these days!) cut the dress out and sewed it up, all in time for the Tango Practica early that evening. Pretty darned good eh? I wanted something different for practising dance in, not the usual shorts and t-shirt style. Sooooo easy. I didn’t do the shirring, I’ve never done shirring before and I didn’t want to fiddle about learning it, I just wanted the dress done. I think I’ll go back and do the shirring as I think the gathers would sit better than the lace sash I used in the photo. The fitting for the bust was pretty genius, actually – simply make longer or shorter in the front along the shoulder edge to suit. 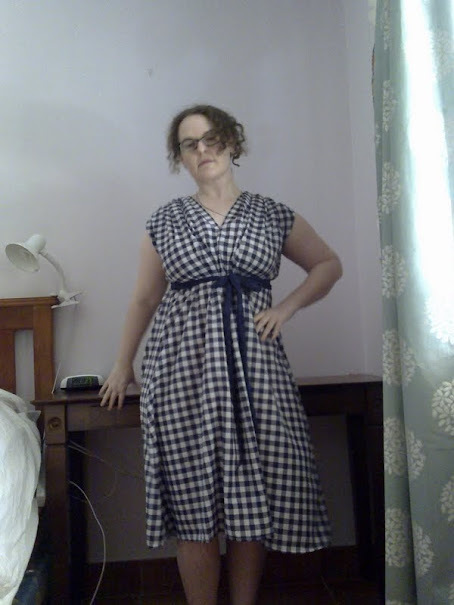 I made mine a little bit bigger and it hung well on me, ie wasn’t pulling up at the front hem to compensate for my bust. I love the shoulder gathering but I think I gathered mine a bit too tight. I think looser so it falls a bit further over the shoulder would look a bit better. Thankyou so much for the pattern (And free too!) Tanitisis! I really appreciate the generosity of the online sewing community! And, so, what’s she up to now, you wonder? 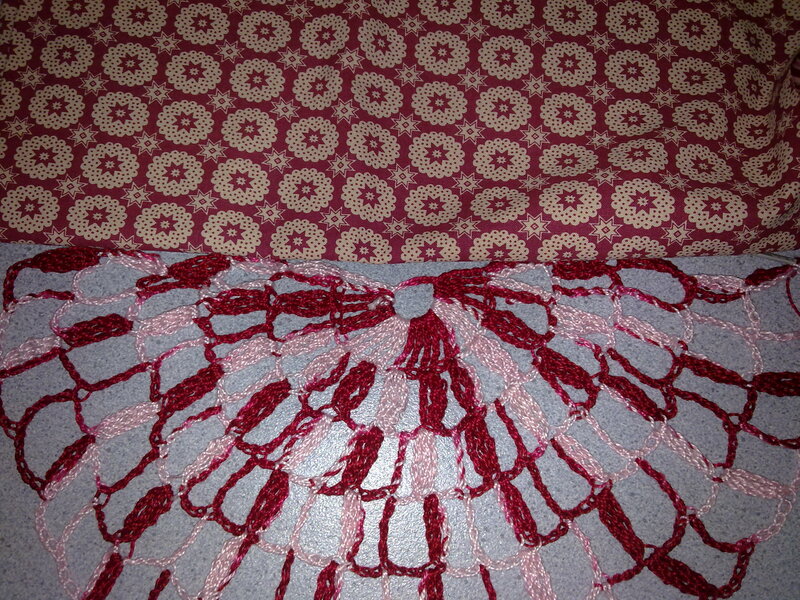 Getting sidetracked from schoolhouse tunic-inspired sewing by crocheting a huge doily, is what. Well, ok, it is a shawl inspired by a doily, apparently. My friend over at Studio Pyraxis commented it looks like a butterfly wing. So true! The pattern is from Caron International, clicking on the picture will take you there. But what kind of scarf to dress it up with? 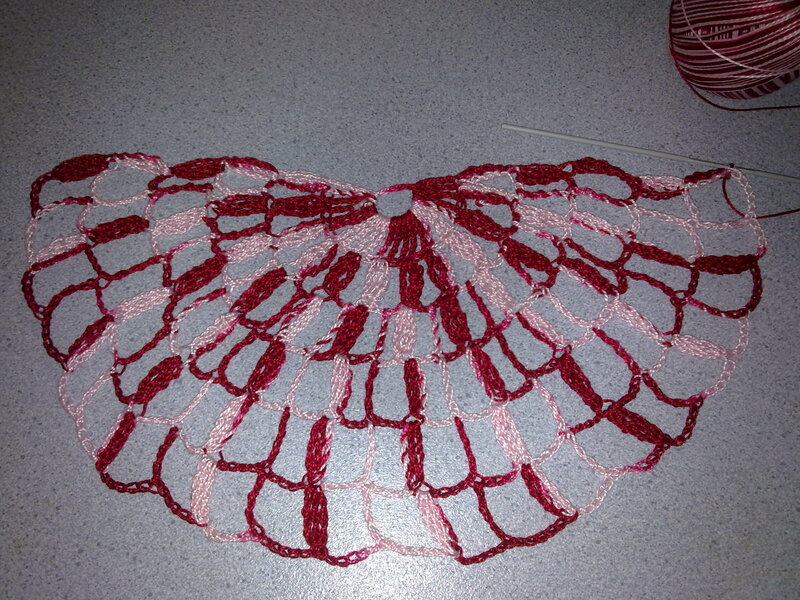 I thought something like the above shawl in the classic latin red fine crochet cotton. 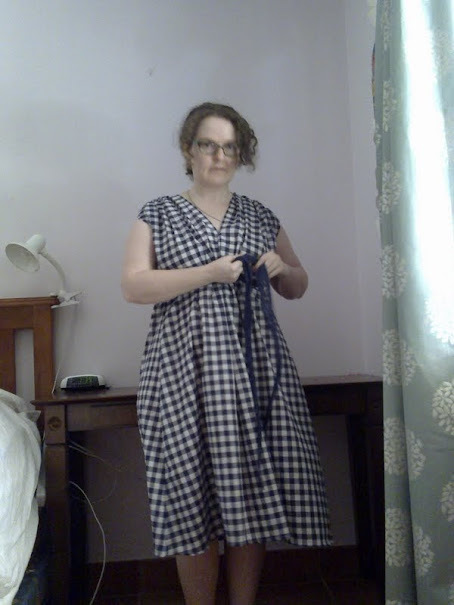 While cutting out the schoolhouse tunic-inspired tunic dress (what a long phrase!) I realised the red of the fabric and the darker red of the cotton work beautifully together. Actually though, when I look at it in this photo, they look quite different, but I think that is due to the way the light coming off the different textures affected the camera. The reds are close enough that I suddenly envisioned my new tunic-dress with a wide band of crochet in this cotton along the hem. Preferably in a medallion-type, fairly geometrical pattern that echoes the fabric design. I’ll have more than enough cotton left over for it. But! but but but! do the two work well enough together? If you trust me on the darker red cotton matching the red in the fabric, the rest of the colours are fairly true to reality in this photo, though the fabric’s beige is a tad softer. When I look at it, I see sadly that the light bits of the cotton are pink, and the light bits of the fabric are beige. Nonetheless, they certainly don’t clash. But I’d rather not put lots of effort into making a band specially for a dress only to find it doesn’t work. I suspect it would be more effective, and less like a random add-on if I also put a narrow edging of crochet around the neckline as well. I admit it. I am Dance Mad. Always have been, always will. For the past 7 yrs Argentinian tango has lit my life. A few years ago I started learning salsa too, just for the sheer fun of all those turns and spins. After all this time to acquire a dance wardrobe, I can usually find something decent to wear for the monthly Tango Milonga, though there is certainly room for improvement. However, salsa is a different story. My salsa wardrobe is … well, non-existent, really. Thus, I am doing a Dance Wardrobe Project. What do I want out of it? Heh… clothes that highlight the dance movements flatteringly, don’t restrict movement, don’t reveal too much. Right. A huge ask! These needs manifest differently in each style of dance. Salsa tends to have a lot of turning, spinning, the arms are raised over the head frequently, articulation of rib-cage and hips. Because it is partner dancing, the woman often facing the partner, the back and side detailing of the clothes is at least as important as the front detailing. Here is a gratuitous vid of salsa dancing a vid to show what I mean. Hmmm, if that doesn’t work out, go check it out at the website while I try to work out how to embed videos here.And here is another lovely salsa video, just for good measure. Tango has noticeably different requirements. There is more focus on leg movements (though they aren’t considered polite when on a crowded dance floor – taking out a fellow dancer with a giant gancho just isn’t cricket, you know :-P). The dancer mostly faces her partner so back detail is important, as is side detail. (So many dresses that would otherwise be perfect for tango, have eyecatching detail on the front and plain, boring backs. Such a shame.) Arm movements are minimal. And there are no quick spins so the risk of the undies on show is a lot less than in salsa. For your delectation here are some gorgeous tango vids. A bit of soul candy. This first one reminds me of Dance Week’s “streets of dance”, organised by Ausdance NT a few years back, where dancers seemingly at random started dancing in cafes and on sidewalks. I and my partner were two of the “random” tango dancers 🙂 The expressions on the chance-audience’s faces were magical! And another, further away, but gives a different view of tango.